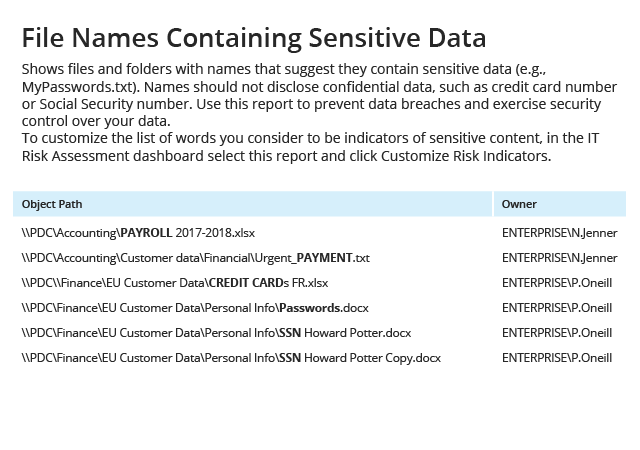 Netwrix Auditor’s IT Risk Assessment reports help you identify weaknesses in your IT security policy settings and practices so you can continually improve your security posture. Quickly spot the risks that require your immediate attention and drill down to actionable details that enable prompt mitigation. IT risk assessment helps you identify vulnerabilities that put your information assets and business continuity at risk. 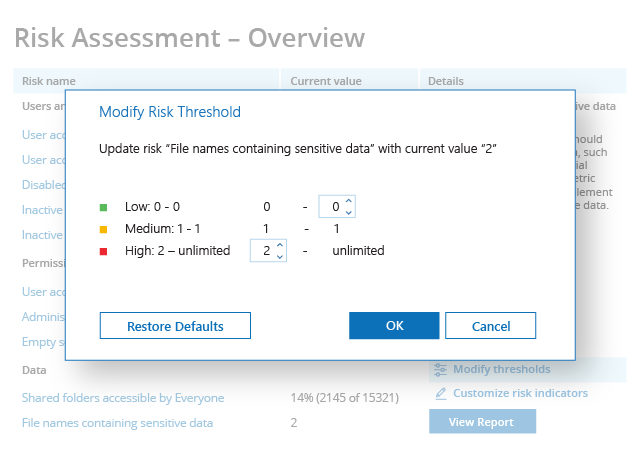 Netwrix Auditor makes it easy to understand your current risk profile, prioritize your response, know what steps to take to remediate each issue, fine-tune risk levels to your particular environment and then review the new risk profile to assess the success of your efforts. By repeating this process, you can continuously improve your security posture, as well as provide proof to management or auditors of your compliance with internal policies or external regulations. 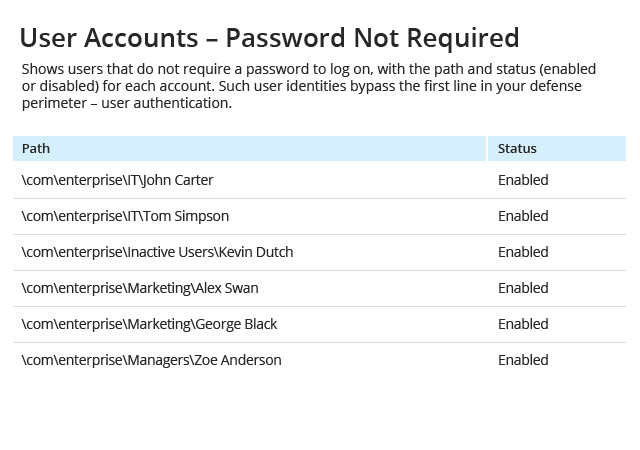 Understand your security posture in key areas at a glance. Automated monitoring and scoring enables you to easily prioritize your risk mitigation efforts. 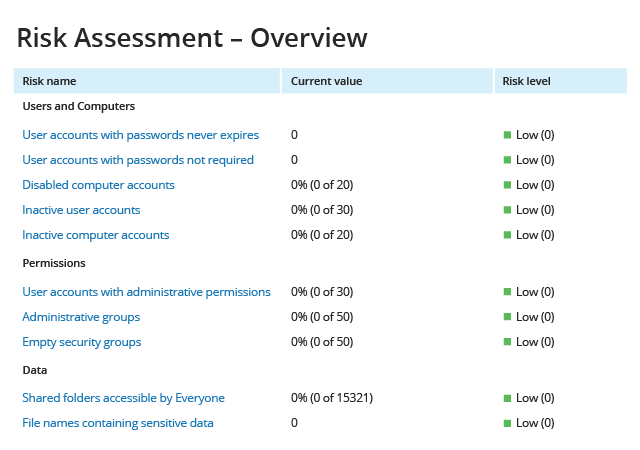 In addition to enabling cleanup prior to launching a security monitoring program, this dashboard also enables continual assessment and improvement in each of three key areas: permissions, data, and user and computer accounts. Start with the area where the risk is highest and dive into the specific risk factors that require your immediate attention. 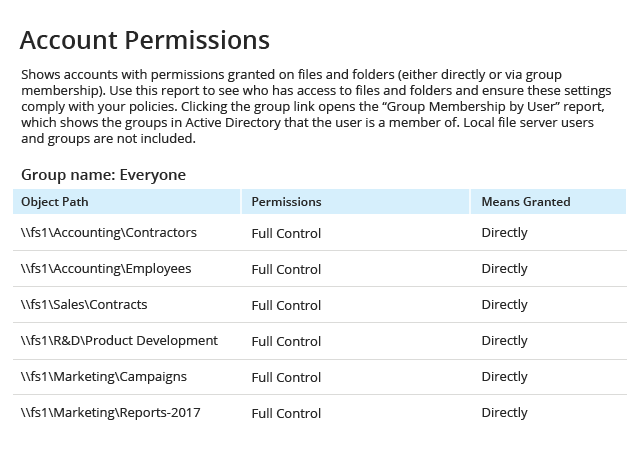 Drill down into detailed reports to determine which policy settings, configurations, permissions or security practices you need to adjust to reduce each risk to an acceptable level. 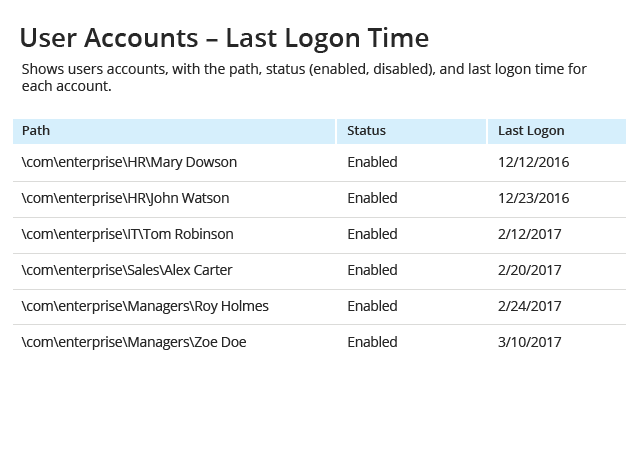 For example, the reports will identify which shared folders are accessible by “Everyone”, which user accounts are inactive but not disabled, which files contain sensitive data in their names or which accounts can access your network without authentication. No one knows your organization better than you do. If you find that the current thresholds for the various risk factors do not reflect your organization’s priorities and risk tolerance, adjust them to redefine when each risk factor is considered low, moderate or high. This fine-tuning will help you keep a close eye on the risks that are most important to your business and remove other factors from your radar. 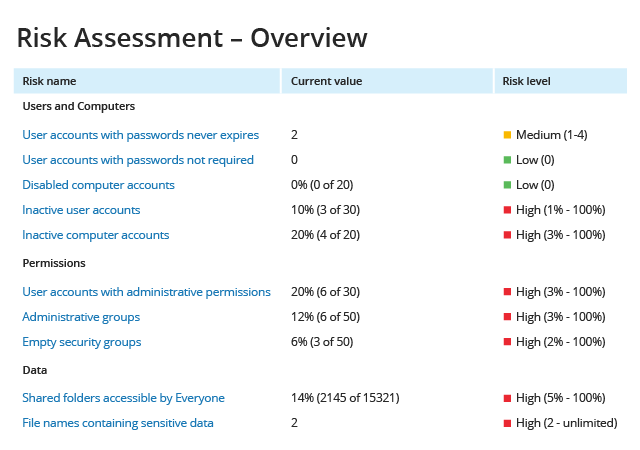 After you have remediated your top risk factors for data, permissions, and user and computer accounts, evaluate whether your security posture has improved, and repeat the risk assessment and mitigation process continuously. Present the IT Risk Assessment report to your management and auditors to prove that you have an effective risk mitigation program in place.